Benton, Haspiel and Kushner launch HANG DAI Editions. 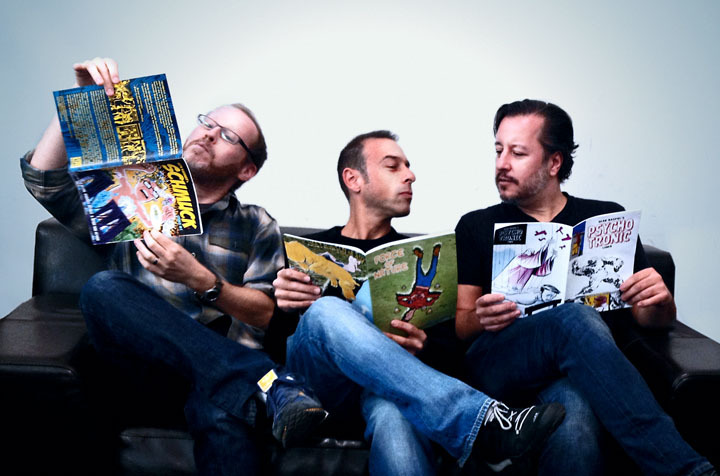 HANG DAI Editions was founded in Brooklyn, NY by Gregory Benton, Dean Haspiel, and Seth Kushner over their mutual dedication to comix art. The imprint focuses on limited edition comix, graphic novels, and art books, with an emphasis on personal interaction at events, conventions, and signings. The three principals each have long histories with traditional publishing venues and have now decided to take on the challenge of publishing independently, under the HANG DAI Editions imprint, in order to retain full ownership and control over select personal creations. The HANG DAI Editions line will debut at Comic Arts Brooklyn on November 9, 2013 with three limited edition comic books. Benton unveils his man vs. nature tale, FORCE OF NATURE, Haspiel brings forth his one-man anthology, PSYCHOTRONIC COMIX, and Kushner collects three shorts from his autobio web-series in SCHMUCK COMIX. The three New York City based creators, who share a studio in Gowanus, Brooklyn, plan to evolve the line into self-financed and crowd funded hardcover books, and are actively seeking distributors with which to partner. Seth Kushner is an award-winning photographer and writer. His photography has appeared in The NY Times Magazine, Time, L’Uomo Vogue, Sports Illustrated, The New Yorker and more. His published books include Leaping Tall Buildings: The Origins of American Comics, (2012, co-authored with Christopher Irving) The Brooklynites (2007, co-authored with Anthony LaSala) and the recently released, self-published fumetti anthology FORCE FIELD FOTOCOMIX VOL.01. and his semi-autobio comic SCHMUCK Comix #1. Seth’s comics work can be seen at TripCity.net and for more info, visit SethKushner.com. This entry was posted in Uncategorized and tagged Brooklyn, comic, Comic Arts Brooklyn, comix, Dean Haspiel, Force of Nature, graphic novel, Gregory Benton, NYC, Psychotronic Comix, Schmuck, Seth Kushner. Bookmark the permalink.